It is finished. The love letter Jack Carlson and I have been writing to the elaborately striped, piped, trimmed, and badged jackets, and the elite athletes and clubs to which they belong, is finally finished. What took three years, 237 athletes, and thousands of trans-Atlantic air miles to and from Europe can now be had in a 9" x 12 " coffee table book. Rowing Blazers is essentially a gentle curtain pull taking you inside the highly atmospheric boathouses, campuses, and trophy rooms of clubs around the world. In that same spirit, I will pull back a curtain of my own, sharing some of my favorite shots from the book with commentary you won't find in the 255 pages of Rowing Blazers. Cameron and Tyler Winklevoss...or is it Tyler and Cameron Winklevoss...let's just go with Winklevii. This portrait of Cameron and Tyler Winklevoss was the first shoot Jack had scheduled for the project. We were driving up to Harvard and I remember thinking, "Couldn't you have picked less intimidating rowers for the first shot?" Not only was Winklevoss the only name I knew in rowing prior to this project, but there were two of them. They couldn't have been nicer and more enthused to be a part of the project. We had them in and out of five or so different jackets they had each accumulated over the years. Ever the consummate professionals. And no, we never talked about Facebook. The hunter green and navy color-way of The King’s School Chester jacket, worn here by Christopher Bartley, is my English jacket of choice. As audacious as the English blazers can be, this one is quite wearable off the river. It is the bold stripes of the English that fashion designers have so eagerly pulled from. Ralph Lauren reinterprets it every so often. However, the fit oft leaves much to be desired. 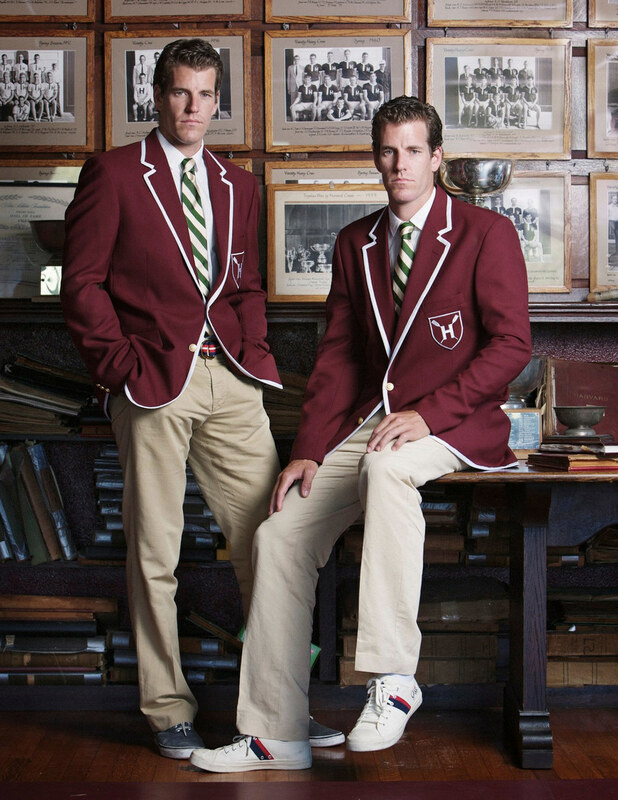 Many rowing blazers are infamous for fitting poorly, looking as if it belonged to your ugly uncle. So we'd clip the jackets as I gently pushed my point of view through styling. I'd tie a four-in-hand knot on everyone (the only knot you really need to know before 40), jam pocket squares into jackets, and often throw my sterling silver engine turn belt around their waists in a pinch. I recall Christopher’s shoes that day being quite square toed so I threw my Nikes on him to introduce a lighter athletic touch, finished off with a haphazard roll of his chinos (sans socks of course). I shot quite a few group shots for the book. The University of London’s heavyweight four is my favorite. With many of the athletes, I'd have only 45 minutes to scout the boathouse or campus, compose an idea, style the rowers, and then create the portrait. This made group shots particularly...challenging. Even more so when you consider after each shoot, location scouting became progressively more difficult out of a necessity for variety. As brilliant as most trophy rooms were, we limited ourselves to only shooting in a handful of them. This is why I'm proud of this photograph in particular, because the University of London boys were at the tail end of our shot list. Which explains how we ended up in a narrow hallway of their boathouse. The moment that light pouring through the large windows hit my eyes, I became fixated on shooting them in this space in between...the space in between the routine of the weight room and the romance of the river. Portraits in the city were rare but Matthew Kochem's is one of the few I shot in Manhattan. Despite being cut from the book, it is one of my favorites. It turns out to be this quiet dusk moment outside the Cornell Club in Midtown. It has a metropolitan feel that refreshingly gilds the raucous boathouses throughout the book. Jack Carlson has represented the United States at the World Rowing Championships and raced for Oxford in the Oxford-Cambridge Boat Races. In 2013, he coxed three different boats to first place finishes in all three of the traditional international rowing regattas: the Henley Royal Regatta, the Royal Canadian Henley Regatta, and the Head of the Charles Regatta. The guy's amazing. A Boston native and an archaeologist by training, Jack is currently a Clarendon Scholar at Oxford University. It is Jack's immersion in the rowing culture that granted us uninhibited access behind the closed doors of this beautiful sport. Rowing Blazers is available at Amazon for $36.00. Tell your family, friends, and frenemies. Thank you to each and every athlete who sat in front of my lens and to Jack for his vision and passion for this project.